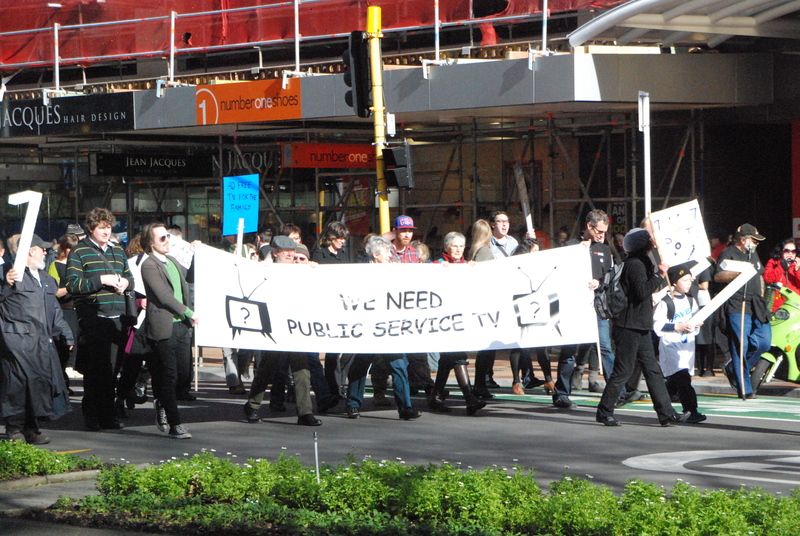 The campaign to save public service television is holding a huge funeral march tomorrow (Saturday 30th) in Auckland. Protesters in Wellington marched from Civic Square to Parliament on Thursday. It’s been an incredible 12 months for us but it’s sad to see our campaign end this way. It’s even sadder to see TVNZ 7 end this way, being switched to black at midnight. TVOne+1 will start at 7am on Sunday and for the first time since TV began, NZ will be without a public service television channel. Yesterday’s march on parliament was a huge success presenting the online petition of 36,155 signatures to Clare Curran (Labour Broadcasting Spokeswoman). Join us tomorrow for our last act. The Funeral March starts at 4.30pm at Queen Elizabeth Sq downtown, we follow a hearse up Queen St, right into Victoria St and up to TVNZ. Then we continue along Hobson St to St Matthew-in-the-City for speeches. Supporters have been asked to bring flowers or candles for what will be a fitting send off for one of NZ’s best ever television channels.